Apart from an amazing deep tissue massage or a pedicure from (is it a blessing or curse that there’s a location one block from my apartment? ), nothing is as calming as my weekly trip to the grocery store. Every Saturday or Sunday (usually the former because by Friday my refrigerator looks as barren as the lands ), I wake up at the crack of dawn (to beat that weekend crowd), make my lists, and grab my shopping bags. Hi, my name is Erin, and I like to select my avocados for the week at 7 a.m.—yes, for fun. Until, that is, I realize my bank account is about as desolate as my aforementioned fridge. Sound familiar? Though not everyone wakes before sunrise with the sparkling aisles of Whole Foods on their mind, most people I know do have some anxiety when it comes to managing a weekly food budget—especially if eating healthily is the goal. And while some weeks our budget might have some wiggle room for splurges (the Postmates app will always haunt us), other weeks, for one reason or another, things are a bit tighter. Which, to be honest, can become stressful. Yes, it's easy to rely on office or impromptu trips to the drive thru for something quick and affordable, but wouldn’t it be easier on our bodies (and budget!) to have a healthy, nutritionally balanced grocery list that's completely adaptable depending on our budget? 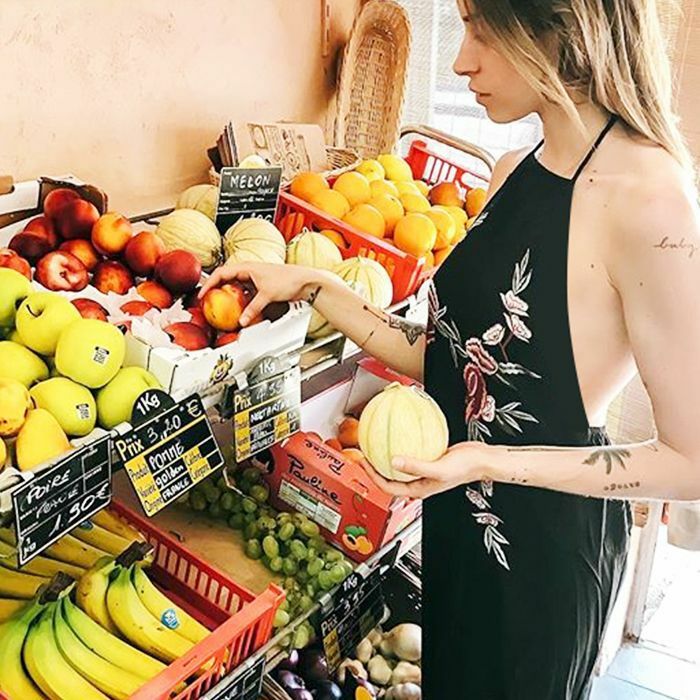 To create some equilibrium, I reached out to holistic nutritionist and founder of , Meryl Pritchard, and asked her to create three healthy grocery lists for three different weekly budgets: $50, $100, and $150. And as an added bonus, she even shared a few of her favorite recipes. Bliss. Keep reading for the expert-curated grocery lists that will help you to eat healthy while staying on budget. Pritchard tells us that if you're working with a smaller budget, it's worth checking out your local farmers market to get the most nutrient-dense options at the lowest price. Plus, she adds, you'll avoid a lot of the unnecessary packaging and waste that comes with grocery store buys. Greens: "Kale, spinach, chard, romaine, arugula—rotate these greens every time you shop to get a variety of nutrients into your diet. You can use them as a base for salads or sauté them as a side for dinners. If they start to wilt, throw them into smoothies or freeze them for future use." Cruciferous vegetables: "Broccoli, cauliflower, cabbage, Brussel sprouts—again, I like to rotate these and buy a couple of different kinds each week. That way, you don’t get tired of eating broccoli all the time and you can pick the best looking items from the market. are easy to roast or eat raw in salads and dinners. Plus, due to their high fiber content, a little goes a long way." Squash: "Spaghetti, zucchini, kabocha, butternut—there is a squash for every season, and all varieties are equally delicious, creamy, and filling. Squash is a great meat replacement in vegetarian dishes, and costs much less than meat, so you can save money and improve your health here, too!" Tomatoes: "Most markets will always have cherry tomatoes, but late in the summer, you will find nice varieties of heirloom tomatoes, as well. I like to put them in salads, use them in curries and dals, or make homemade marinara." Avocados: " are a healthy fat and can be a great breakfast, snack, or lunch. Try making avocado toast, plain with lemon and sea salt, or throw them on top of a salad. Leftover avocado can also go into smoothies! It helps your body absorb the fat-soluble vitamins and provide a nice texture." Onions and garlic: "It's always good to have onions and garlic on hand to create a flavorful base for dinners and soups." Herbs: "Mint, parsley, cilantro, chives, thyme, rosemary—always buy these from the market. They will be package free, half the price of what they would cost in a store and a lot fresher." Veggies: "Snap peas, green beans, cucumber, bell peppers, mushrooms—buy whatever catches your eye or is in season." Berries: "Blueberries, raspberries, blackberries, strawberries—berries are great to buy from the market, and you can usually get a really good deal if you buy three different baskets of them. They can be used to top oatmeal, overnight oats, yogurt, or just eat them plain as a snack. When they’re starting to turn, freeze them for your smoothies." Seasonal fruit: "Stone fruit, passionfruit, tropical fruit—pick up a couple of seasonal fruits to have on hand for snacks and breakfast." Citrus: "Lemons, grapefruit, oranges—you can use these for breakfasts, snacks, and even salad dressings. Citrus helps cleanse the lymphatic system (your sewage system) and is a great source of vitamin C."
Eggs: "I only buy eggs from farmers markets. These eggs are coming straight from your local farms and the yolks are a dark orange, as opposed to a light yellow color. Most of the time, the farmers will tell you exactly what they’re feeding their chickens and how the chickens are raised." Orange juice: "Many markets will have fresh-squeezed OJ, which is preservative-free. I recommend bringing a large mason jar that they can fill, which will be fresher juice and save you the plastic container. They also usually give me a discount for bringing my own packaging." Sweet potatoes: "I eat these for breakfast, lunch, and dinner. They can be used as a hash, baked and stuffed, roasted, steamed, puréed. They're filling, so just a couple should last you the week." Bread: "You can’t beat locally baked bread. I like sprouted loaves or sourdough. I bring my own bag or pillow case to get my bread to go." Honey: "It’s important to eat your local, raw honey because it will help keep your system stay immune to local allergens. This is another item I never buy in a grocery store because it is more expensive and less effective to use honey from out of state." If you have an extra $50 for groceries, Pritchard recommends starting at the farmers market with the list above before heading to your local grocery for the below add-ons. Oils: "Olive and coconut—always purchase cold-pressed, virgin, and organic. is for cooking at high heat, and olive oil is to be used for salad dressings and to top cooked dishes. You can also use grape seed oil as an alternative to coconut oil for cooking." Grains (bulk bins): "Brown rice, quinoa, millet—just like greens, I like to rotate these three grains for plenty of variety." Beans and legumes (bulk bins): "Chickpeas, lentils, black beans—for salads, soups, and dinners. These are cheaper than meat and a good substitute for animal protein at a lower price point." Seeds (bulk bins): "Sunflower, chia, sesame, hemp—these are great for smoothies, salads, and dressings." Almond butter: "You can make your own almond butter or buy it raw in the store. Trader Joe’s actually has a good organic, raw almond butter for $7 as opposed to $9 to $16." Bananas: "They don’t sell these at the farmers market, so if you’re making smoothies you will have to buy them from the store. Buy them ahead of time and let them ripen until they have small brown spots on the outside of the skin—that means the chlorophyll has broken down within the fruit, and the antioxidant level has risen. They'll be sweeter and easier to digest." Nuts: "Cashews, pumpkin seeds, almonds, walnuts, pecans—many markets will sell a variety of nuts, and if you’re lucky they will also be sprouted. Nuts can be used to create dressings, sauces, fake cheeses, and nut milks, and they are a protein-rich alternative to meat." Ground turkey: "This is a good lean white meat and is usually cheaper than most other meats found in the store." Organic tea or coffee: "Peppermint, rose hips, chamomile—I like to have a chai tonic in the morning, an in the evening. Purchasing coffee or tea in the store is going to be a lot cheaper than buying it in a coffee shop. This is an easy way to save money and cut back on wasteful packaging." Have some extra room in your budget? Opt for some high-quality, nutrient-dense items to round out your healthy grocery list. Superfoods: "Cacao, maca, spirulina, goji berries, lucuma—these are some of the most on the planet to boost your smoothies and salads with. At Kore Kitchen, we sell a ($115), which includes eight of these superfoods and a guidebook with benefits and recipe ideas. Coconut yogurt: "I'm currently obsessed with —the brand makes a fermented, raw coconut yogurt that comes in a few different flavors. It’s pricey but worth it. I don’t recommend any processed packaged yogurts, which usually have preservatives, extra sugar, or binders." Wild salmon: "This should be dark orange in color, almost red. Salmon is expensive and also a larger fish, which tends to have more mercury, so buying this once a week is a good rule of thumb. I like to pan sear it and then bake it in the oven for a few minutes. It's great to pair with a few veggie-based sides for dinner." Protein powder: "My personal favorite is the Sprout Living ($24). It’s raw, vegan, sprouted, includes superfoods, and blends well into smoothies." Kombucha: "My drink of choice is usually water, but if you like soda, kombucha is a healthy alternative." Kimchi: "It’s important to get fermented foods into your diet to . I like to have kimchi on hand for quinoa bowls or even fermented cabbage to add on my avocado toast." У нашей организации авторитетный веб сайт , он описывает в статьях про www.kinder-style.com.ua. Наша организация предлагает www.kinder-style.com.ua в любом городе.